As I haven't posted for a bit, I thought I would share a couple of cards I will be teaching at an upcoming in-home workshop. Hope you like them. Love the shimmer on the orange stock and the gorgeous fall feel, but let's talk about those die cuts on the green one, I need those...lol! Two beauties, Kelly. I especially love the fall one - I'm totally into fall art at this point and I breathed a sigh of pure bliss when I saw your card. Absolutely lovely!!! Fantastic cards! 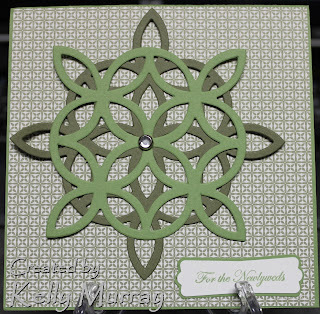 I love the green die cuts and the fall card is just gorgeous.